Rick Flag is dead. That's leading the Suicide Squad for you. With the threat of the People imminent, Amanda Waller needs a replacement, so she looks at the in-house candidates. This makes sense; when someone new comes to Belle Reve penitentiary she doesn't know how far she can trust them (see the traitorous, now dead NSA agent/People double agent Amanda Harcourt). With the likes of Harley Quinn, Captain Boomerang and co, though, she had a good idea of just how treacherous, double dealing and ultimately manipulable they are. Better the devil you know, and all that. Not that all Suicide Squad members are incorrigible inmates. 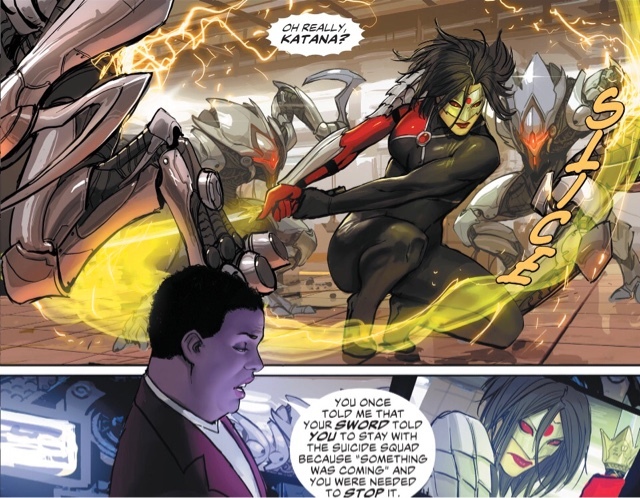 Sword-wielding superheroine Katana has shown the most loyalty to Waller, and wants the job of leader. Then there's the awful Australian Captain Boomerang. 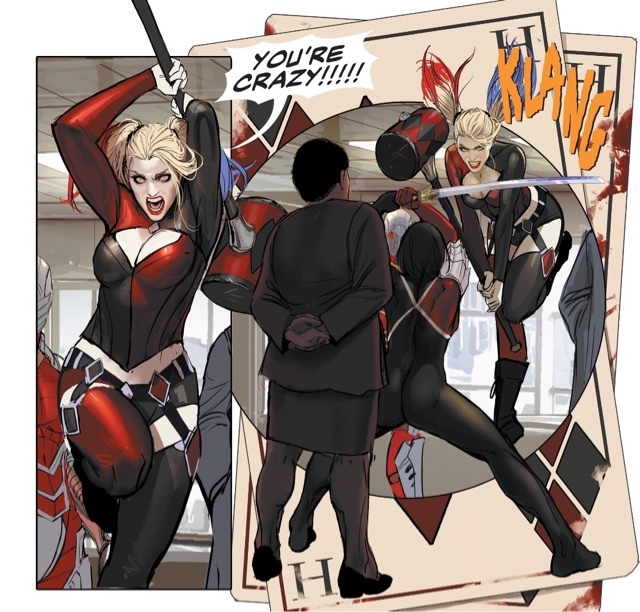 Psychiatrist turned psycho Harley Quinn. 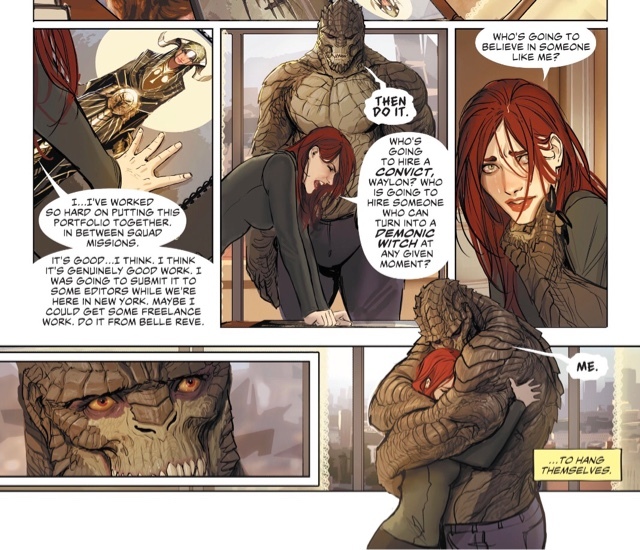 How about Killer Croc (the clue's in the name), or his unlikely girlfriend June Moone, the Enchantress? Perhaps assassin-for-hire Deadshot wants a shot? Living Looney Tunes Cosmonut? This is my favourite Suicide Squad issue of DC's New 52 era. I enjoy the regular brand of mayhem, with the team trying to grasp victory from whatever disastrous mission they're on, but this is all character work. Writer Rob Williams slows things down and uses the space to remind us who the members are today, what they want. It's madly entertaining, with the highlight being the sweet romance of June and Croc, set against the backdrop of a New York that's for lovers. Well, most lovers. The fact that amid the madness her life has become, June manages to hang onto her dream of making it as an artist, well, that's just so touching. And who knew the demonic force that possesses her would be the very definition of supportive? As for who finally gets the job of Squad leader (wage: one poisoned chalice), I'll leave that for you to find out. Along the way, as well as Williams' smart, witty words you'll be able to pore over the lush illustrations of Stejpan Sejic - I didn't realise the new Aquaman artist was on this issue, so talk about a lovely surprise. Every page is a delight, full of beautifully composed and finished images that work together to tell the story. 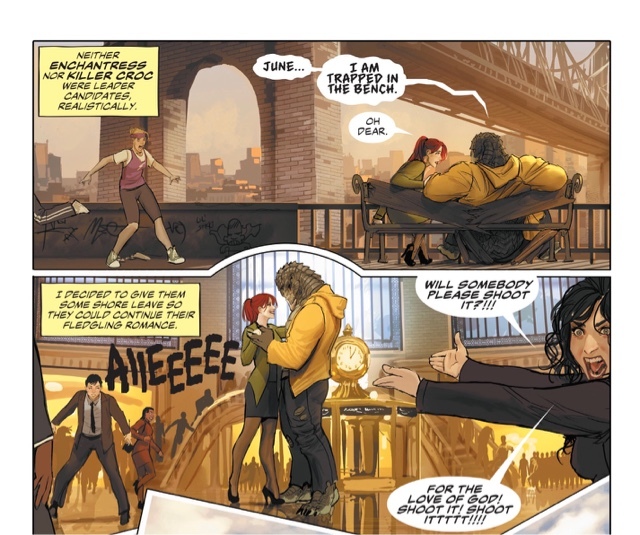 Sejic is able to provide a painted-style finish without the result seeming stiff, as in Katana's fight with some Belle Reve training robots. Occasional flourishes such as a playing card frame for Harley add to the reading experience where in other hands they could break the flow. And who would expect a picture of a crocodile man and a reluctant witch to exude such tenderness? Suicide Squad #20 is a brilliant team effort, and that includes the excellent letterer Pat Brosseau and editors Andy Khouri, Harvey Richards and Brian Cunningham. The cover by Green Arrow artist Otto Schmidt has a wildness that suits Harley, while illustrator Whilce Portacio (when was the last time we saw him at DC?) 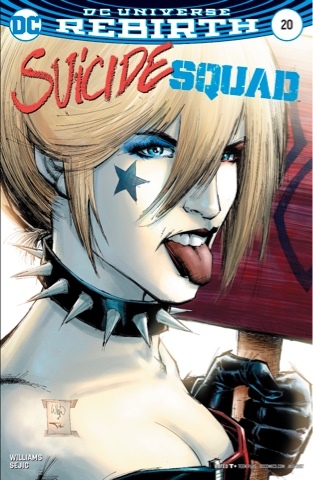 and colourist Alex Sinclair's variant is a well-done Harley headshot ... I just wish it didn't seem to be all Harley, all the time. Whether you're a Suicide Squad fan or not, try this issue - it's just a brilliant superhero comic. 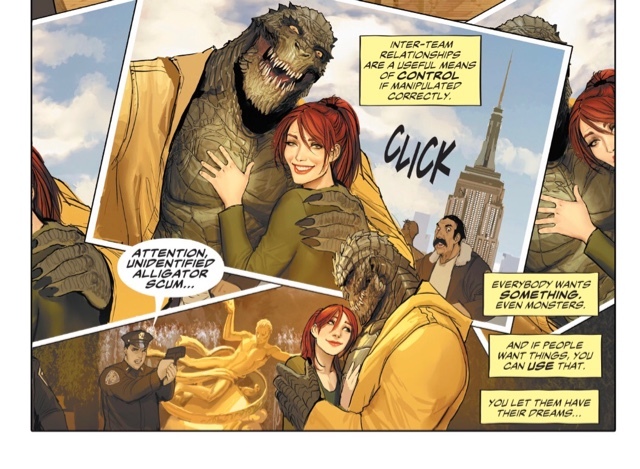 I don't routinely buy this comic but a Croc/Enchantress romance might be to nudge I needed. I love Sejic's art (added Aquaman to my pull list) and so might pick this one up! Great review! Although I want to know who the new leader is! I shall tell you away from here! I bought Ostrander's Squad when it first came out many years ago, and enjoyed Giffen's brief take on it in the OOs. I tried the first few issues of this book based on praise for Rob Williams' as a writer in general. 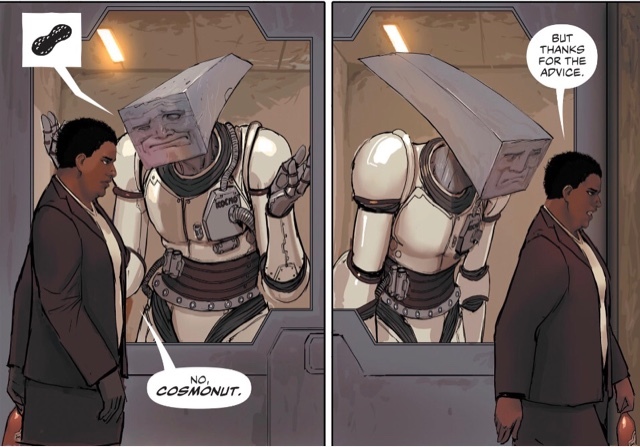 And he does have a knack for humor and some good character moments. Plus I love the concept of the Squad and liked that Williams was using so many of the originals from the Ostrander run. The title routinely receives praise online, month after month. And I guess maybe Williams' approach is to make it this pedal to the metal, 2017 Dirty Dozen, with a lot of spectacle. Look, the Squad's in Russia!!! Look, they're fighting super terrorists who are killing politicians!!! Now General Zod is a member!!! Now they're fighting Zod!!!. But for a longtime fan of Ostrander's work, to me Williams Squad is a dumbed down book. The efforts at any sort of political intrigue are surface at best, and really most of the stories have not been about "missions" per se but about The Squad either fighting Squad clones or cleaning up Waller's messes (the Justice League tie-in, the Zod story arc). How about a couple stories about the Squad actually accomplishing something? Going under cover? Bringing in other villains with certain powers for specific missions? All the stuff that, in my view, makes a good Squad book. And Williams seems to be relying on readers' familiarity with the characters rather than doing a lot of his own work with them. Ostrander developed relationships over several issues. Williams would have us accept that Quinn and Flag got together over the course of about two. And we never learned squat about Flag to care about his recent sacrifice. Military guy jailed for standing up for some principal. But he never really butted heads with Waller about anything. Gone was any of the tension that Ostrander wrote between the manipulative Waller and the straight as an arrow Flag when they would fight about missions and objectives. And Boomerang has been turned into just another thug murderer. The "charm" of what Ostrander did is take a Silver Age villain and make him lethal. Ostrander's Boomerang still used his various trick weapons. Williams' Boomerang just throws razors. Boring. The most frustrating thing is that Williams, beyond the cast, has also tried to embrace other aspects of Ostrander's run. He revived Rustam and the Jihad characters from that Squad era. But did we ever really learn anything about them? No. Most of the Jihad wound up being cannon fodder, and Rustam was never really developed into a character. All we knew is he used to work for Waller, she betrayed him, now he wants to put an end to corrupt world governments. Blah blah blah. Cookie cutter motivations. Yes, Williams Squad is certainly entertaining. It's a pop corn comic. And it's better than what DC tried with the team in the New52. But it is also clearly aimed at not just new fans, but long-time Squad fans. And for this one, it completely misses the mark. It's a shallow take on a beloved concept. Thanks you so much for the thoughtful comments. I understand what you're saying, but I don't think that Williams should be trying to duplicate Ostrander's superb run. Yes, he should be aiming for the same level of quality, but trying to clone the classic series seems to be inviting disaster. If he can channel the spirit of what Ostrander and Kim Yale set up, while finding his own voice, we may get a new magic. I don't think he should duplicate Ostrander's run, either. 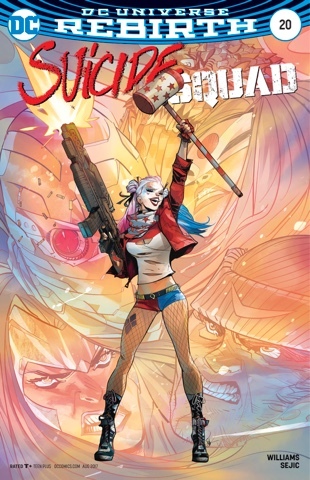 But a book like Suicide Squad needs to be meatier than what Williams has so far offered. Better plotting, better characterization/character building. And better/more interesting missions. Ostrander was able to juggle all of that plus develop a fascinating supporting cast of prison employees. I just feel like the Suicide Squad we're getting now is a pretty shallow one. Boy, now you really have me missing the support staff, that's certainly an angle that would improve the current series.